As winter yields to spring, gardeners and mushroom lovers, gourmets and vegetarians can grow the biggest, most nutrition-packed shiitake mushrooms by following Nature’s way – eating shiitakes grown on forest logs, a healing, cleansing food that can revitalize and energize the body. 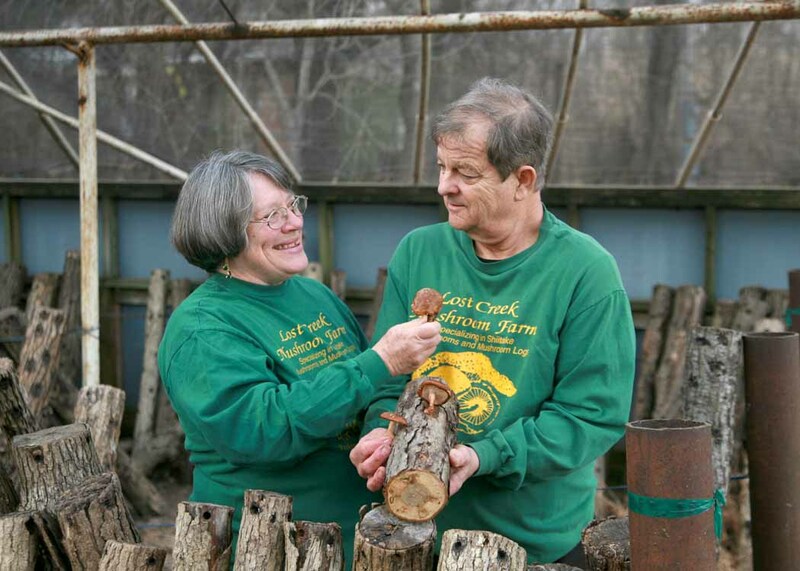 Lost Creek Mushroom Farm sees an upsurge of grow-your-own shiitake log kit sales every spring as people respond to the natural impulse to gather, grow and eat mushrooms. 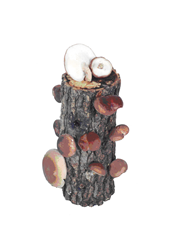 Lost Creek Mushroom Farm Shiitake Log Kit. Eating log-grown shiitakes revitalizes and energizes the body after the winter's heaviness. Shiitakes are tasty and healthy, as we know. They can also elevate our emotional state. Just having a log in the living room adds an enlivening energy to the space. “March through May is the natural fruiting season for shiitakes and other mushrooms,” according to The Mushroom Lady, Sandra Williams of Lost Creek Mushroom Farm, where warmer temperatures and spring rains bring out shiitakes by the thousands. “It’s also the time of year when our bodies naturally crave foods that strengthen us and help dissolve winter sluggishness. The Mushroom Lady should know. She and her husband Doug have been studying the nutritional and medicinal properties of mushrooms for 25 years. They have watched mushroom and mushroom log sales peak every spring -- and again in the fall when the body needs to clear and strengthen itself for the coming winter. “Our bodies and psyches are more aligned with the natural cycles than we realize,” she said. Shiitakes grow wild in Asia, popping out of fallen hardwood trees and branches with spring rains and temperatures of 70° F/51°C during the day and 50°/40°C at night. “Research and technology have provided a method for us to cultivate organic shiitakes on logs in a way that imitates the natural process,” Williams explained, "making it easy to grow shiitakes at home." When logs are ready to produce mushrooms, or “fruit,” Doug moves them into a greenhouse and hand-picks every log shipped to customers. Log owners “shock” their logs by soaking them in non-chlorinated ice water. That triggers the fruiting cycle – just as in Nature the temperature changes and spring rains urge the mushrooms through the bark. Harvest follows in 6-10 days. Logs can be fruited every two months for years. They need regular soaking in non-chlorinated water and can live indoors like plants. Placing them outside under shade in the spring and fall produces more and larger mushrooms. 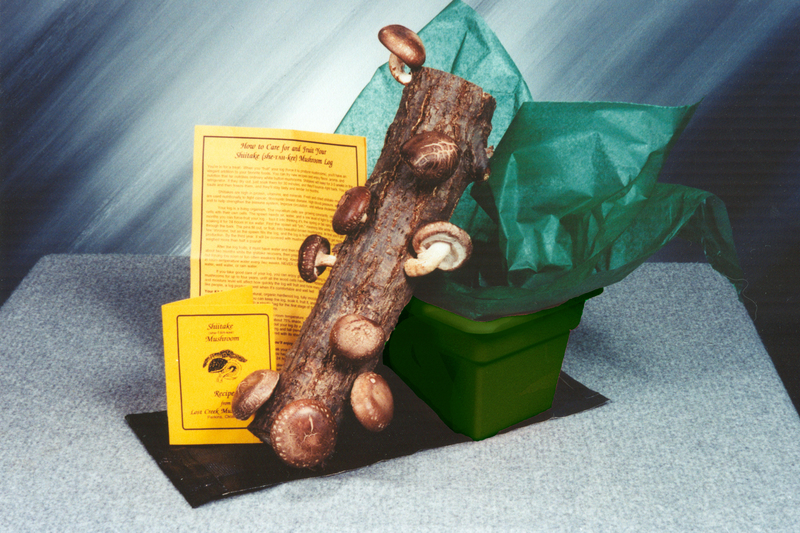 Lost Creek Mushroom Farm shiitake log kits include: The Original Tray Kit with a 14-inch log and its own tray for soaking, fruiting and storing the log, priced at $50, and two for $90 shipped to the same address. The best-selling 10-inch Single Log Kit sells for $30; the Ma and Pa Log Kit with two 10-inch logs for harvesting shiitakes every month for $50, and a 6-inch ‘Shroomie at $18. Kits contain one or more logs, ready to grow mushrooms, instructions and recipes. Prices include shipping and handling. Prices are slightly higher at Amazon.com. Order online at http://www.shiitakemushroomlog.com or by phone at 1-800-792-0053. A portion of sales supports the Williams’ Mushrooms in Ghana Project and mushroom education and production in other areas of the world.